While some competent scholars may disagree with some of the following; the Theophanies (Theophanies: a visible manifestation of a deity) of Jesus Christ in the Old Testament is an accepted doctrine, beyond dispute based solely upon Scripture. These two passages are absolute proof that God visited during at least these two situations. The common response of men when they are aware that they are in the presence of Angels is to fall upon their face prostrate in fear. Whenever this is happened, and it is an Angel of the Lord that is being worshiped, Angels advise the humans to stand up; to not worship them because they are servants of God just like the people they are visiting (Acts 19:25-26; Rev. 19:10; Rev. 22:8-9); with the exception of these 2 passages. there is only one Angel that has ever sought to be worshiped as God, his name was Lucifer, and now is Satan. Angels understand the blasphemy of allowing themselves to be worshiped by man. Yet, on these 2 occasions worship is just not allowed, it’s demanded. The only logical answer is that this is God demanding worship of man. And to give further insight into these expressions. The reason why God tells these 2 men to take off their sandals is because the ground that they are standing upon is hollowed, it is holy because God is there. In oriental and Eastern cultures, the ground that is owned by a man is his and his alone (this is seen in Oriental houses in that when you enter their house, you take your shoes off as the sign of respect to the owner and to the house). The point that God was making is that He not only owns the ground where these 2 men stood, and therefore they had no right to wear man-made sandals, wherein they would stand upon their own work – they were to stand according to God’s mercy, not their own ability. Part of the reasoning was that man does not have the RIGHT to step upon the flowers, the grass, or even the sand of God wearing shoes he made himself while in God’s presence. No, the point that God was making is that they were only allowed in God’s presence, according to God’s mercy and they needed to recognize that they were naked and prostrate before Him. In these cultures there is great symbolism in the feet and there coverings, sandals. To have the right to untie a man’s sandals displayed authority over him, this is seen when John the Baptist declares that he is unworthy to unstrap Jesus is sandals. This is seen in that the lowliest job a servant could do was to wash the feet of guest entering a house, as seen in Christ humbling Himself in doing so. Feet always symbolized a man’s walk, how he conducted his life, his decisions, his power. 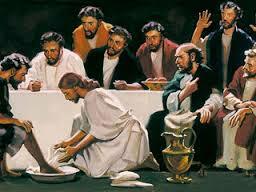 And notice that when Jesus shows the lowliest act of servitude, it is when he is cleaning feet. The reason why cleaning feet was the job for the lowest servant of the household is because at that time walking through the street you collected mud, animal thesis, and all kinds of unsightly rubbish. it should also be noted that within typology Jesus use the word walk, involving one’s feet concerning how one carried out their life and what they did on a daily basis. There is great symbolism within the Bible. What a display of character that the God of the universe would choose to step into this dirty arena on earth to die for sins, and yet at the same time display this same humility in washing the dirty feet of his disciples. Notice that Christ’s feet were nailed to the cross as well as His hands (Psalms 22:16). See Endnote #4 concerning passages that display symbolism in regards to feet in the Bible. As noted over 100 years ago this incident concerning Moses and the burning bush is more remarkable than we might observe at first. Seeing a burning bush in the deserts surrounding Israel is not that unusual due to lightning strikes. However this burning bush was unusual in that it caught Moses’ attention wherein he approached it to investigate what he was observing. The fact that the bush was on fire holds no significance, the fact that the bush was not consumed is miraculous. Many times we fail to see the significance built within the symbolism of the burning bush. What we call typology, is the study of symbols as used throughout man’s existence. However, it is only the typology found within the Bible that we are addressing, though man has used symbols from the beginning in order to extend understanding within communication. Symbols, as in biblical typology are never meant to replace the meaning of the literal thing, words, or acts, to do so is called allegorical interpretation; and takes away from the literal text which is never to be done. typology is always meant to add perspective, intensity, and clarity. Re: what is referred to as allegorical interpretation, Origen of Alexandria (AD 185-254; though many pastors and scholars teach that Origin was one of the Orthodox fathers the church, this is due to a lack of investigation wherein even a superficial investigation into Origen uncovers that he did not believe and denied the deity of Jesus Christ, the atonement, and embraced many of the prevalent Gnostic heresies of the period from the headquarters of the Gnostics, in Alexandria Egypt. it is studying his writings as recorded by others as well as the history of the church fathers that this is validate. Yet many that believe in higher criticism, who respect and admire Westcott and Hort, attempt to give origin credit as they both greatly admired him, though they too did not believe in the deity of Jesus Christ or the atonement. See Endnote #1 for more on him), a teacher that greatly influenced Augustine; divided Scripture into three segments; introducing allegorical interpretation as one of those segments which is been abused for over 2000 years. Allegorical interpretation, which Origen referred to as the spiritual interpretation (which I will refer to as allegorical, because it is not spiritual and should not be referred to as such), was according to him to be the first and most important form of interpretation, giving it preeminence over literal translation as well. Next he taught the literal and typological form of translation. He taught that the highest form of biblical interpretation was allegorical. Yet, according to this warped sense of interpretation, the allegorical would take the place of the literal to the extent that he could make Scripture say anything he wanted. This is where Amillennialism has its roots, where Scripture concerning prophecy as symbols only are used and turned into an allegory with no literal interpretation concerning real events which were yet future in their occurrence. This is why many Orthodox churches which came out of the Reformation, based upon Luther’s unwillingness to fight directly against allegorical interpretations has continued this teaching which origin began and became the foundation of the Catholic Church, as he is one of the main fathers of Catholicism. When Luther broke away from the Catholic Church, this is one of the few areas where he maintained their doctrine (See Endnote #2), wherein allegorical interpretation took the book of Revelation and states that it is not a future event, that it is merely symbols to be understood allegorically – theoretically, rather than prophecies which will physically occur. Now back to the subject of typology. It should be understood that typology does not embrace what is known as allegorical interpretation, which we would refer to as allegorical in nature as seen in Origen of Alexandria‘s example. When typology uses the word allegorical it is not in the same sense of taking the place of the literal, as Origen did. Biblical typology simply states that on top of or added to the literal meaning, when words are used in a manner which is unusual to the text or in nature, that this unusual wording holds further value to be investigated. An example is seen in the building of the tabernacle, as also seen in every chapter in the Bible. The tabernacle utilized precious metals for specific meanings. Gold is always been used concerning deity (as seen in a Kings crown which was made of gold, 2 Samuel 12:30; 1 Chronicles 20:2; Esther 8:15; Psalms 21:3; Revelation 4:4; 9:7; 18:9-12), which is seen in the furniture which was wooden with gold overlay. Wood (shittim wood, the same as acacias wood) was always considered a symbol Christs natural human life (Zachariah 3:8; 6:12;Isaiah 11:1-3; Isaiah 4: 2; even the town that he was raised in regards this issue; as Jesus was referred to as the Nazarene. The Hebrew root for the word Nazareth, which comes from Netser is literally translated, “shoot or sprout” wherein the teaching that Jesus was the branch of God is yet further seen in translating the title: “Jesus the Nazarene“, as “Jesus the branch.” In the Hebrew these or synonyms). The furniture of the tabernacle is wood coated in gold, which is a symbol of the incarnation of Jesus Christ. He was all of man, represented by the wood, and completely divine, represented by the gold. Silver is always used as a symbol of redemption (Numbers 3:45-47). The Levitical law stated that every male that opened the womb belonged to the Lord (Regarding the ministry) and had to be redeemed with a Temple silver shekel in order to redeem the child back to the family. If you remember that Jesus was betrayed for 30 silver Temple coins, which is also referred to in the book of Zachariah (Zachariah 11:12) concerning Judas’s betrayal of Christ (Matthew 26:15), wherein Christ became the redemption of mankind. If you approach the tabernacle you would notice that there is a white linen fence taller than you can see over so that there is nothing remarkable to it (“For he shall grow up before him as a tender plant, and as a root out of a dry ground: he hath no form nor comeliness; and when we shall see him, there is no beauty that we should desire him.” ~ Isa. 53:2), the same way is there was nothing beautiful concerning Jesus regarding the exterior. Linen was always a symbol of purity and sinlessness, also symbols of Christ. The outer wall which was covered with linen was held up by sockets of silver, again pointing to the fact that redemption surrounded the tabernacle of God, that you could not go over it or under it, but you had to make your way to the only entrance that was allowed. We could talk about the outer covering of the tabernacle building which was made out of different skins which were not comely or beautiful, yet on the inside the first covering you saw as you walked in was linen with purple and gold figurines. Purple and gold always addressed royalty. As you approached the tabernacle you would see that there was only one way into it (“Jesus saith unto him, I am the way, the truth, and the life: no man cometh unto the Father, but by me.” ~ John 14:6), always facing the east, which pointed towards Jerusalem God city (“Him that overcometh will I make a pillar in the temple of my God, and he shall go no more out: and I will write upon him the name of my God, and the name of the city of my God, which is new Jerusalem, which cometh down out of heaven from my God: and I will write upon him my new name.” ~ Rev. 3:12), where God met man in the Temple. Indicating that there’s only one way to salvation through this opening, which had no door to stop a man (Because Jesus was the door – “Then said Jesus unto them again, Verily, verily, I say unto you, I am the door of the sheep.” ~ John 10:7“), who could enter in based upon belief. After you entered the tabernacle enclosure the first thing you would run into is the brazen (bronze) altar of sacrifice. You have no chance of relationship with God without first dealing with your sin, and God’s sacrifice through Jesus Christ for it, all of which was symbolized but the brazen altar of sacrifice. Bronze was always a typology of judgment because it was the only metal that could maintain fire without melting, as the metal regarding sacrifice and judgment. It is the fact that we must first come through Jesus Christ in order to approach God, understanding that Jesus is the only sacrifice accepted by God, wherein fire was used to concerning the sacrifice as judgment, typifying the fact that Christ died on the cross paying the price for our sin. One last interesting fact, have you ever considered why within the Holy of Holy, the Ark was not a singular piece of furniture, it is addressed as two separate pieces. The Ark (the box with no top) and the Mercy Seat (a temporary lid which served another purpose other than being connected with the box). But what was a symbol behind these articles. The Ark was a sepulcher; and the Mercy Seat which was placed on top of it is a throne seat. These two articles are not directly fused together or connected with attachments. The Ark is (shittim wood, the same as acacias wood) wood covered in gold, where the Mercy Seat is made of pure gold. A sepulcher is normally connected to the lid which is not the case here, which is why the lid is separate to indicate it is temporary in the same case that Christ was temporarily a human being covered in gold symbolizing His deity, wherein he would physically die in being identified as deity only afterward. Yet the Mercy Seat was made with two angels symbolizing where Christ would sit in Mercy to those He loved, and judgment for the others. The Angels bowed their heads in inverted their eyes from looking where Jesus would be sitting on the seat which was a sign of reverence, and fear concerning the Majesty and deity of Jesus Christ. What this is amazing is that the same type of wood (shittim wood, the same as acacias wood) which was the type of thorn bush that was burning, the same word that was used on the tabernacle, the same wood of the cross, and the same wood which made up the thorns on Christ’s brow; symbolized would that had been alive in now was dead due to sin, due to the curse of sin which is also seen in the thorns. What’s amazing is that there are other types of woods that could’ve been used, yet it is the consistency that is necessary for typology to be maintained within the Bible, God does not show himself inconsistent in validating the types and models he utilizes, also referred to as shadows. Many types to illustrate the many facets of that which is being symbolized in order to enhance perspective, yet none of the types or examples are never used concerning a different substance which is being symbolized, otherwise there would be in inconsistency wherein contrary and confusing symbolisms would be made. God does not work this way. Because the Bible is God’s vehicle of where we are to obtain faith (“faith cometh by hearing and hearing by the word of God” ~ Romans 10:17), and faith cannot grow where there is inconsistency. It is amazing of the 40 some odd Arthur’s of the Bible they never contradict each other concerning typology, this displays a single author of one mind which we refer to as a Holy Spirit, He is a true author of God’s Word, wherein man were utilized as scribes, yet still contributing part of themselves without violating God’s design – this is something only God could do. This begs the question why use typology, or better stated concerning our above example, what was the tabernacle an example of? The tabernacle is a symbol of Jesus Christ. Have you noticed how little many people think that the Old Testament speaks of Christ. Yet through typology Christ is seen in every book, every chapter; such as the tabernacle. It’s very easy, what Moses saw when he sought a bush that was on fire and not consumed, wherein he understood the symbolism; was grace. The arcade bush was a symbol of the curse wherein thorns were created. Fire has always been a symbol of God’s judgment, which is why the sacrifices of the and the Temple used fire on the brazen altar’s. So what was so amazing about this bush was the fact that when Moses looked upon it it was a symbol of sin being judged, yet not being consumed or destroyed -this was an enigma, a mystery that would exist decades until a soldier would look up at a man being crucified in saying this was truly a righteous man, with the man making a statement (not a question), father, why have you forsaken me. This is the question of the ages? Why would God judge and condemn a righteous man who was innocent? It was so that the condemned would be set free! This is another example of Jesus Christ, and God’s grace. Jesus Christ was judged for the sins of the world, in fact it says that He was made sin for us (“For he hath made him to be sin for us, who knew no sin; that we might be made the righteousness of God in him.” ~ 2 Cor. 5:21), this judgment came from God because of sin, yet concerning the burning bush, it was not consumed and destroyed. The reason was, Jesus Christ was sinless deity, wherein God provided grace for us that deserved none, we who are the Acadia bush in the world, because he who deserved no judgment, took our judgment upon himself and became a curse judged yet not consumed, the same as the was on fire yet not destroyed. What Moses saw was grace. Men are not attracted to God out of judgment and fear, they are attracted by grace. This is not to say that man should not fear God, he should have a healthy respectful fear for God understanding that he is simple and God is deity. There is a difference between being attracted to God, and being fearful to the place of not having a personal relationship out of fear. We need to have a fear of hell and judgment, yet what keeps bringing me back to God’s throne after I mess up is God’s grace. It is his grace that is so appealing, so compelling that even after I fall down yet one more time, I crawl to the cross where he stands me up, not because I am fearful, because fear drives me away from God the same as it did with Adam. Fear makes me attempt to get right before God in an attempt to find my own type of fig leafs. And while fear is healthy, it is grace that attracts me, like him off to the flame of his love. 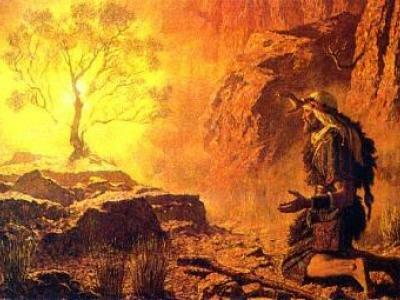 This is why the wonder of the burning bush was so important – it was an example of grace that caught Moses’s attention. And is one of the thousands of Scriptures which display at typology, a model, a symbol, a shadow, a representation of Jesus Christ. What also should be noted concerning the exact identity of the deity that spoke out of the burning bush, as well as the other listed times in the Bible that deity is seen in the Old Testament, it is the fact that God the Father’s dwelling place is in heaven upon His throne, He is never seen leaving it. God is never seen coming to Earth after the fall, when the Earth is cursed because it is a sinful place. The Holy Spirit, is a spirit and does not maintain a physical body (Re: Matthew 3:16 concerning the spirit of God the descending “like” a dove, we must understand that the word “like” points out that this is a type, not an actual Dove. When the words; “as” or “like” are used, they are used to indicate that the substance is not complete or real, it is only the appearance of something not the substance itself. This is seen when Satan is referred to as a “roaring lion” in 1 Peter 5:8 – it uses the word “as”. The Lion of the Tribe of Judah, wherein typology is utilized, is always a reference to Jesus Christ the Messiah of Israel. Whereas in Peter this is where Satan attempts to look like Jesus, in the same way that the antichrist attempts to present himself as the Messiah. It is when we understand Greek grammar and how words work that we come to better understand the complete consistency of God’s Word), or the ability to be contained within one (you talk about a mystery). Therefore, the only Divinity to make an appearance in the Old Testament is Jesus Christ. And it is He that becomes a human in the New Testament, a Kinsmen Redeemer (please see the article concerning “Kinsman Redeemer“), to die for the sins of the world as one of us. It was by man that sin entered to the world, and it is by the God/man that sin is paid for. Jesus is the only one that is God, and that has visited man. The following is an excerpt from the acclaimed theologian and scholar; Dr. Herbert Lockyer’s book “All the Doctrines of the Bible,”3 concerning Christ’s pre-incarnate appearances in the Old Testament. The most striking Old Testament preparation for Christ’s Advent, however, were those wonderful theophanic appearances. These pre-incarnate manifestations of His were designed to prepare the world for Christ’s more permanent abode in human flesh. Biblical scholars identify “The angel of the Lord” – “The angel of his presence” – “The angel of the Covenant” (Genesis 22:14; 31:11, 13; Exodus 14:19; Isaiah 63:9; Malachi 3:1), as Christ, the Son of God, in pre-incarnate manifestation. The pre-existent Christ as God, spoke of Himself as the coming Seed of the woman. As God He was the promised; as the God-Man, He became the promise. (see Genesis 3:22-24; Exodus 6:3, 5; Jude 1:14, 15; 2nd Thessalonians 1:7, 8). This is the first time the angel is named. Four times over we have the title, “The angel of the Lord,” “Jehovah”. Here we have Him seeking the miserable outcast – a prophecy of His coming redemptive mission. (see John 4:14). Typical deliverances were wrought by “The Angel of his presence,” who was no ordinary angel because of His exercise of divine prerogatives, the manifestation of divine preferences, and the claiming of homage due to Deity alone. As Joshua succeeded Moses as the leader of Israel, the same mysterious Personage appeared, this time as “the captain of the host of the Lord.” Joshua had to learn that he was subordinate to another Leader worthy of adoration and worship. One of the three heavenly visitors entertained by Abraham repeatedly assumed, and received, the name of Jehovah with honor due only to Him. Both Abraham, and his son, Isaac, were the recipients of promises from the Lord of Glory. The angel, who redeemed Jacob from all evil was no common celestial messenger, but “the angel of the covenant” Himself who, at different periods of the patriarchs life, visited him with words of reassurance. As the Omniscient One, the angel appeared to Manoah foretelling the birth and character of an extraordinary son, Sampson. Here we have a visible revelation of divine majesty and a forgleam [“foreshadow”] of the character of the coming Messiah. In his pre-Incarnate appearance to prophets, Christ came as the Revealer of God. The words and burdens communicated to Isaiah, and others, came from “The angel of his presence” Isaiah’s Savior. (Isaiah 63:8-10). Other evidence of Christ pre-existence are hinted at in Daniel 3:25 (RV), John 1:15; 6:22; 1 Peter 1:10, 11; Psalms 110:1; judges 6:12; 1 Corinthians 10:4, 9; Exodus 14:19; Colossians 1:16. Allegorical interpretation was allowed to cultivate due to a non-literal interpretation of the Bible. Allegorical interpretation was referred to as spiritual interpretation, or figurative interpretation. This type of handling of God’s Word started with the work of the third century Alexandrian theologian, Origen (Origen Adamantius), (ca. 185-254). He was completely dedicated to the allegorical method of interpretation like his mentor, Clement of Alexandria (Another teacher which many think of as so great wherein the reality displays he taught an immense amount of on Orthodox teaching). Origen spiritualized virtually every Christian doctrine. Under Origen’s influence, the blessed hope of the Christian apologists—belief in Christ’s imminent return to establish His kingdom—began to yield to the spiritual hermeneutics of Alexandria. He maintained a theoretical threefold understanding of the meaning of Scripture: the literal, typological, and spiritual that supposedly corresponded to the threefold human nature—body, soul, and spirit. In practice, however, he most frequently made a distinction between the literal and the spiritual method of interpretation of Scripture (e.g., De princ. 1.3.3). The literal method, which Origen considered crude and unreliable, was allowed to the weak of intellect, the mass of Christians in general. The spiritual method, extolled by Origen, was reserved for a few like himself on whom the grace of the Holy Spirit is bestowed in the word of wisdom and knowledge (De princ. Preface, para. 8). Origen’s method of exegesis was so subjective that it allowed for an almost infinite number of symbolic meanings and interpretations of the Biblical text, most of which bore little resemblance to the plain meaning of the words. Mystical theological speculation was typical of Origen’s eschatology. For example, according to his doctrine of the apokatastasis (restoration of everything in the universe to its original, spiritual, primeval state), there will be no hell or eternal punishment. Rather, the Logos will purify every living being, presumably even demons and Satan himself. Then Christ can return and raise all people, but in spiritual bodies only (De princ. 1.6.1-3; 3.4-6). As for the meaning of the Second Coming, Origen explained away the gospel references to a literal, visible return of Christ and substituted a completely spiritualized interpretation (De princ. 2.11.2). In essence, Origen taught that Christ’s return signifies His disclosure of Himself and His deity to all humanity in such a way that all might partake of His glory to the degree that each individual’s actions warrant (Comm. On Matt. 12.30). In effect, Origen took the catalytic event of the prophetic calendar and reduced it to a kind of general, mystical encounter [that was only in the past, no future hope] with Christ. Origin taught physics as well as metaphysics and other disciplines which would ingratiate themselves to an allegorical mindset. This seems unusual in that he took a literal Christ declarations to cast off your eye if it caused one to sin (Matt 19:12 ?) defend you in that origin committed self-castration, which he later regretted. Origen’s allegorical interpretations, including his views on Bible prophecy, gained wide acceptance in the church of his day. His influence, followed by Constantine’s “Edict of Milan” (313 A.D.), which created religious tolerance within the realm; prepared the way for creation of Nicene Christianity as the state religion by Theodosius I (AD 347-395) in 380 A.D, with him being the last Emperor of both the Eastern and Western Roman Empires. Augustine’s (354-430) teaching in the fourth century, are usually cited as the principal causes of Premillennialism’s eventual replacement by Amillennial eschatology. Augustine became the most noted and influential theologian of the Western Church, writing “The city of God,” which portrayed the church as a new civic order during the ruins of the Roman Empire, which fractured into pieces by 476 A.D. It is no coincidence that the dark ages accompanied the allegorical teachings founded by Origen, and made fashionable by Augustine. It is during this time that the Bible was abused not only by a lack of handling by the masses, but by biblical figure to teaching by the clergy. This was the hallmark of the medieval church, with the Roman Catholic Church utilizing this type of butchery concerning God’s Word concerning any problematic doctrines, in which they turned into heresies, perhaps the most prominent eschatology. As the Reformation was springing up across Europe, and Martin Luther among others there came a move to a literal interpretation, yet they maintained a spiritual interpretation / Allegorical interpretation concerning eschatology, which has been prevalent in the Orthodox churches for almost 500 years. It was not until the late 1800, and the work of individuals such as John Darby, Cyrus I. Scofield, and Charles Caldwell Ryrie, that a return to literal biblical interpretation once again became predominant within the church, as it was for the first three centuries wherein literal interpretation is all that the church fathers utilized. It was through a literal teaching that God dealt with man according to a progressive revelation of His will, which became known as dispensationalism. Dispensationalism; is based upon a literal form of hermeneutics, which became defined according to the dividing of certain responsibilities or stewardship (the meaning of dispensational) of the man into ages (time periods) according to God’s revelation in which the return of Jesus was understood to be literal, wherein eschatology (Last days events) became known as pre-millennialism. There are 3 major forms of eschatology, they are: Amillennialism (meaning no millennium, whereas in the Greek “A” in front of the word means “none,” or against), Premillennialism (which is a literal translation medium, meaning before the millennium), and Post-millennialism (meaning after the millennium, which is a teaching that the millennium occurred shortly after the time of Christ within the first few centuries of the church). Dispensationalism, which may be subject to debate, yet it is the literal interpretation which it utilizes which should never be subject to debate. When one examines individuals within the Bible that were interpreting prior prophecies, they always without exception interpreted those prophecies as literal and never figurative. This is always the case, and therefore is the model that we must utilize. To re-state again, if the people that God called to do his work interpreted prior prophecies written within the Bible in a literal manner, this is the only example we are allowed. This is not to say that there is no place for typology, which is where words are used in unusual form to indicate that they do not have a typical meaning. in this case where the word meaning is clear with in the passage there is always a literal interpretation, and wherein words are used in an unusual manner these words indicate a symbol which is to be used in conjunction with the literal, not opposed to it. Therefore, when the tabernacle is spoken about in a manner that utilize certain elements, those elements were literally used. Yet on top of this literal interpretation we understand the symbols of those elements which reinforce clarity concerning what God wants to bring forth. It has been stated that typology is like adding color to a black-and-white picture, it never takes over or changes the literal elements of the picture. It simply adds nuance an understanding wherein clarity is gained and the picture becomes more beautiful than it was before. 3. Source: ALL THE DOCTRINES OF THE BIBLE, Herbert Lockyer, Zondervan Publishing House, Grand Rapids, MI 49502, USA, 1964-1975.